Kanye free throw video: Great artist, poor elbow position and follow-through. 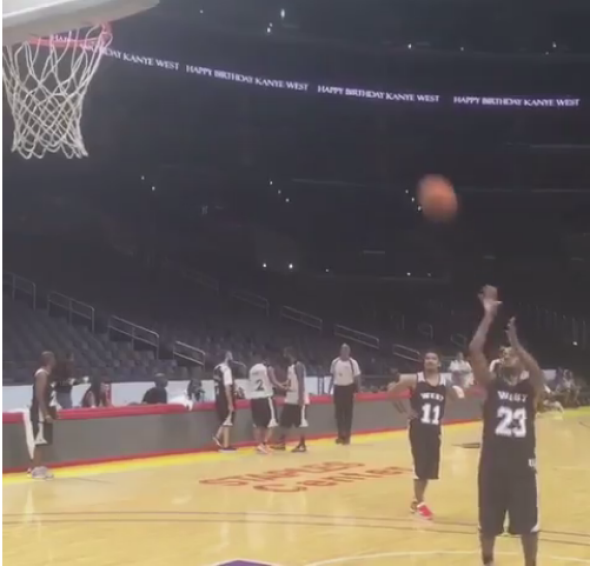 Kanye West shoots a free throw during his birthday party at Los Angeles’ Staples Center. Kanye West loves basketball. Per multiple accounts, Kanye and his musical collaborators played regular morning pickup games during the Hawaii recording of his 2010 masterpiece album My Beautiful Dark Twisted Fantasy. His Monday birthday party involved a game on the floor of Los Angeles’ Staples Center (home of the NBA’s Lakers and Clippers), a perk for which his wife, television’s Kim Kardashian, reportedly paid $110,000. The man likes to play ball. But is he any good? How does his obsessive genius as an artist (and generally obsessive/perfectionist approach to life) translate onto the court? Two brief clips from the birthday party have made their way online to help us answer that important question. First, a free throw. His hand placement is good. The beginning of his motion is smooth. He bends his knees to get his legs under the shot. His elbow is way out to the right. It’s hard to aim your shot like that. You want to get your elbow tucked as far in under your hand as possible. He doesn’t follow through at all, and in fact yanks his hand backward a bit after releasing the ball. Again, you might make some shots like this, but it’s going to hurt your accuracy in the long run. Despite involving the randomly contrived situation of throwing a free throw off the backboard while his friends watch (lane violation! Entourage yes-men violation! ), this video says good things about Kanye’s skills, demonstrating solid timing and hand-eye coordination. He also looks pretty spry for someone who just turned 38. He’s just balling! True. True.